Scott Olson/Getty ImagesPresident Donald Trump at a roundtable discussion with business leaders at Northeast Iowa Community College in Peosta, Iowa, in July. President Donald Trump is scheduled to visit Council Bluffs, Iowa, on Tuesday. Trump is set to announce earlier in the day a change to national fuel standards that would give a boost to Iowa corn farmers. The Trump administration is expected to allow the expanded use of E15, a fuel that contains 15% ethanol and 85% gasoline. Currently, most fuel is 10% ethanol and 90% gasoline. Farmers in the state are being battered by the international response to Trump’s tariffs. 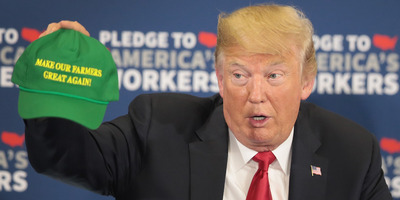 President Donald Trump is set to try to make an appeal to one of the states hit hardest by his administration’s tariffs by offering a policy tweak long sought by Iowa’s farming industry. Trump on Tuesday will head to Council Bluffs in Iowa, which has been rocked by retaliatory tariffs in response to the US’s trade restrictions. The “and more” could be a reference to a new policy the White House is expected to announce on Tuesday designed to provide a boost to Iowa farmers and fulfil a longtime promise from the president. The year-round use of E15 has long been a goal for Midwestern politicians and Iowa’s farming industry, particularly the state’s Republican senators, Chuck Grassley and Joni Ernst. Trump promised in the run-up to the 2016 election to expand E15 use. “He thinks that it’s good to have domestically produced energy here, and he thinks it will be good for the agriculture industry as well as the economy overall,” a senior administration official told reporters Monday. The move is likely to set off a fight with the oil industry, which opposes the shift to a higher percentage of biofuels, and could prompt backlash from oil-state politicians, such as GOP Sens. Ted Cruz and John Cornyn of Texas. Most fuel is 10% ethanol, and the oil industry argues that higher levels of ethanol can be harmful to car engines, though the EPA has approved the use of E15 in all light-duty cars since 2001. In an attempt to assuage the industry, the Trump administration is also expected to propose changes to a system of credits that allow oil refiners to get around certain ethanol obligations. While the move is a big win for farmers in the Midwest, it may also be an effort to soften the blow from Trump’s intensifying trade war with China and other nations. Iowa, in particular, is expected to take a significant hit from the trade disputes. According to the Center for Agriculture and Rural Development at Iowa State University, Iowa’s gross state product could take a hit of $US1 billion to $US2 billion from Trump’s trade fights. Similarly, the US Chamber of Commerce has estimated that $US1.4 billion worth of Iowa exports are subject to retaliatory tariffs from China, Canada, Mexico, and the European Union. The move follows other efforts from the Trump administration to soften the blow of retaliatory tariffs, including $US4.7 billion in aid to farmers from the Department of Agriculture. It also carries a political benefit for the GOP, which is fighting to keep the governor’s mansion in Iowa. According to the RealClearPolitics average of recent polls, the Democrat Fred Hubbell is up 3.5 percentage points over the Republican incumbent, Kim Reynolds, who took over as governor in 2017 after Terry Branstad became Trump’s ambassador to China. Meanwhile, GOP Rep. David Young, from Iowa’s 3rd District – which includes Council Bluffs – is facing a tough challenge from the Democrat Cindy Axne.